FRANCAVILLA'S THE BLACK BEETLE RETURNS TO DELIVER AWARDWORTHY PULP ACTION! August 28, MILWAUKIE, OR - Dark Horse Comics is thrilled to announce a new creator-owned series from Francesco Francavilla, the 2012 Eisner Award winner for Best Cover Artist! 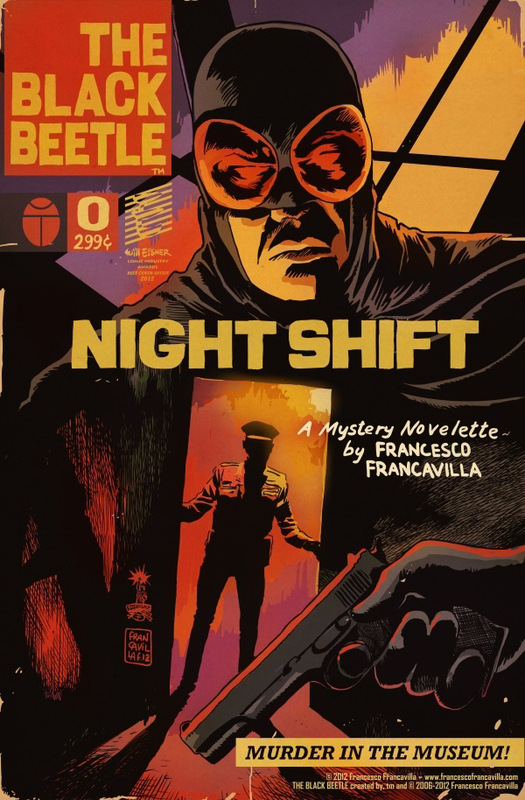 Francavilla's critically acclaimed The Black Beetle returns in December with The Black Beetle #0, which will collect the three-part story entitled Night Shift that originally appeared in the pages of the Eisner Award–winning Dark Horse Presents. The issue will feature a brand-new cover, twenty-four story pages, and bonus sketch material and art! January brings The Black Beetle: No Way Out, a four-issue story that marks the first full series for Francavilla's Black Beetle, continuing from the self-published, limited-edition ashcan comic of the same name - the first appearance of this exciting new pulp hero!